Caravaggio (1571–1610) is as mythical in his talent as he is in temperament. The notorious artist’s work had an enormous influence on Baroque painting, and marked the turn away from Mannerism in Italian art. Caravaggio’s realistic observation of the human form set the stage for future artists to explore physical and psychological reality; what would become a major theme in modern painting. Amongst others, Caravaggio inspired and ignited the work of Vermeer, Rembrandt, Rubens, and Velazquez. The Italian painter’s life is shrouded in mystery and intrigue. While he was successful during his lifetime, receiving regular patronage, he was renown for a hedonistic lifestyle and regular outbursts of violence. His reputation as a womanizing ‘bad boy’ is complicated by his sensual rendering of masculine bodies, seen in Boy with a basket of fruit, and rumors of homosexual inclinations. What art history has no debate over though, is his contribution to the development of a Baroque naturalism. Caravaggio’s paintings make masterful use of light, particularly in their employment of chiaroscuro; the dramatic contrast between light and dark pigments. While tenebrism lights his work with theatricality, his method of painting directly on to the canvas and working with live models whom he refused to idealize, resulted in pieces like Judith Beheading Holofernes and Madonna di Loreto, where the spiritual and religious themes are tempered by a gritty observed realism. 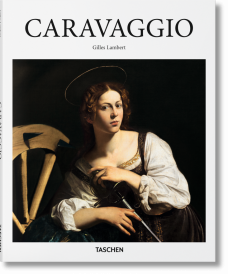 TASCHEN’s books on Caravaggio include a Basic Art Series publication as well as an XL monograph with detailed chronological summaries, including a biography which lays out the life and work of the artist. Major works such as Basket of Fruit, Young Sick Bacchus, The Fortune Teller, Saint Jerome Writing, David with the Head of Goliath, The Entombment of Christ, and Madonna and Child with St. Anne (Dei Palafrenieri) or Grooms’ Madonna are reproduced in large format illustrations with captions. The TASCHEN Book on Caravaggio’s complete works features all of the 80 paintings in total attributed to him, including his self-portraits. High resolution photography provides close-ups of Caravaggio’s ingenious details: dirty feet, sly gestures, and piercing looks.